The production of emulsion droplets from immiscible liquids has become an essential research tool across numerous scientific fields. Single emulsions are the simplest form of emulsion consisting of a liquid droplet dispersed in a different fluid and are often stabilized with surfactants. While they are simple in concept, controlling the size of the droplets formed can be a significant challenge. As compared to traditional batch methods for generating droplets, microfluidics enables users to generate monodisperse droplets emulsions, foams, gels and suspensions with consistent size, fluid mix and concentration. The precise control offered by microfluidic systems helps improve emulsion yield and reduce wastage to negligible levels. Microfluidics also simplifies the process of selecting the optimal surfactant and carrier fluid for generating the desired monodispersed droplets. Emulsion droplet size can impact how flavors and aromas are released from emulsions such as hot chocolate and mayonnaise. Size also impacts the speed at which drugs or agrochemicals are delivered and released, and the length of time needed between treatments. Segmented flow – forms slugs with size larger than junction size. 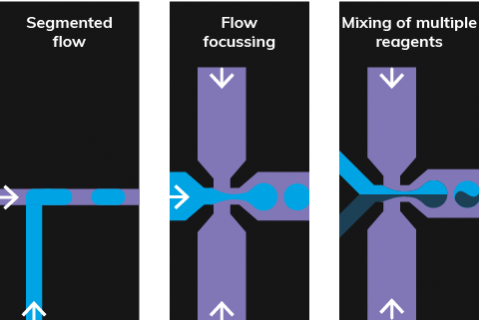 Flow focussing – forms droplets with a wide size range relative to the junction size. Mixing of multiple reagents – droplets can be used as small reactors to achieve a high level of control over chemistry or to form gelled beads. Methodology for production of large monodisperse water droplets in an oil carrier stream with droplet sizes ranging between about 20 µm to > 100 µm. Methodology for production of small monodisperse water droplets in a mineral oil carrier stream with droplet sizes ranging from 2.7 µm to 10.7 µm in diameter. Methodology for production of small monodisperse gas bubbles in water carrier stream with bubble sizes ranging from 6 µm to 40 µm in diameter. 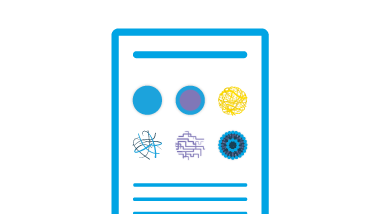 Want to know more about single emulsions?